Turkey's third longest suspension bridge, the Nissibi Euphrates Bridge, has been completed after 33 months of work and is open to pedestrian traffic. 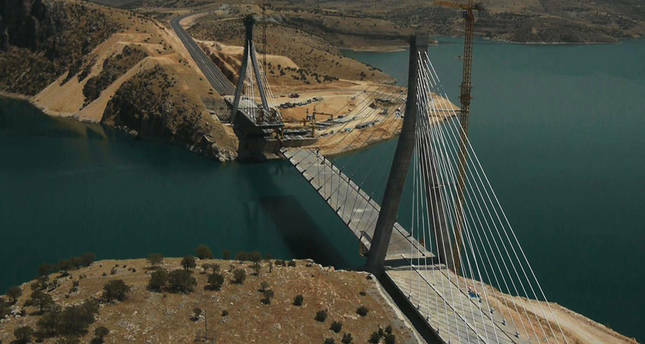 The cable-stayed bridge, which spans the Atatürk Dam on the Euphrates River, connects Şanlıurfa's Siverek and Adıyaman's Kahta districts. The project, which was undertaken by Turkish engineers and architects, was completed after the placement of the last segment two weeks ago, stirring great excitement in the region. The Nissibi Euphrates Bridge, which has a total length of 610 meters and width of 24.5 meters, cost TL 80 million ($34.1 million). The bridge also has 96-meter-high pylons and a middle span of 400 meters. With the retention of water in the Atatürk Dam in 1992, roads that connected Siverek and Diyarbakır became submerged, which reduced transportation facilities in the region to only ferries. The people of Adıyaman have suffered economic, cultural and social disadvantage for 23 years due to troubles in transportation and have expressed their happiness as they can now travel without waiting long hours. Twenty years after the Atatürk Dam came into effect, on February 26, 2012, the foundations of the bridge, which is described as "the Bosporus Bridge of Southeastern Anatolia," were laid by the Ministry of Transportation, Maritime and Communications on instruction by then Prime Minister Recep Tayyip Erdoğan. Passing through Adıyaman, which was previously called "the blind street," the bridge will provide access for the provinces of Bitlis, Siirt, Şırnak, Batman, Mardin, Van and Diyarbakır to western provinces.